Small, compact cars are really making a comeback in America, and we’ve driven quite a few here, including the new Ford Fiesta. The all new Mazda 2 is based on the same platform as the Fiesta, so you’d assume they are pretty similar cars. While they’re similar in size, that might just be where the similarities stop. We’ve had the opportunity to drive a few different models of the Fiesta and on every occasion we’ve come back with the same opinions. It’s a great car for the money. Lots of fun to drive on tight, twisty roads and economical. 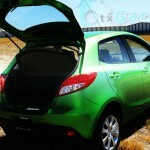 So what did we think about the Mazda 2? 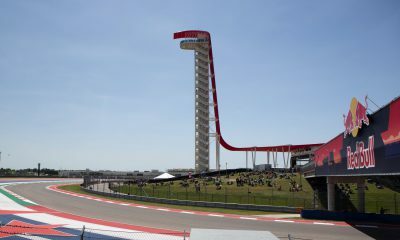 Mazda obviously has roots in racing and they have been branding their portfolio to remind you of that fact. So the first area where the Mazda differs from the Ford is in the weight of the car. Mazda knows lighter is better. The Mazda 2 is only a few hundred pounds heavier than the Lotus Elise, one of the best handling and fun cars you can buy. It’s also a few hundred pounds lighter than it’s cousin, the Ford Fiesta. This really translates into less body roll and more agility around corners. 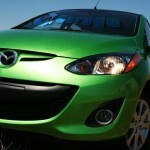 The Fiesta is good on windy roads, but the Mazda 2 is great. We had this car zipping around Dallas, namely some of the back roads around White Rock Lake. If you’ve ever been out there, you’ll know you can’t pickup a lot of speed, but you can have lots of fun in the corners, and in this Mazda, we really had some good fun. 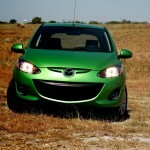 The Mazda 2 does have 1 less liter in the engine than the Fiesta. 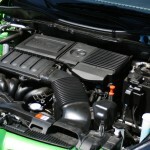 All models come equipped with at 1.5 liter 4-cylinder engine that pushes out 100 horsepower and 98 ft-lbs of torque. 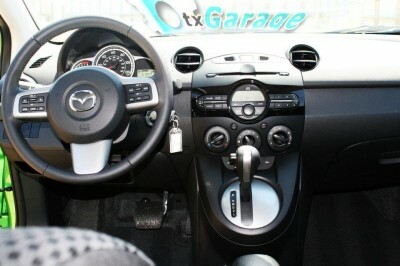 Our tester came equipped with Mazda’s 4-speed automatic transmission, but it can be had with a 5 speed manual. 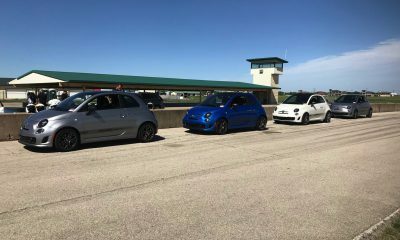 This is less than the Fiesta, but remember, you’re pushing less weight around. Obviously this is also the big letdown of these small hatchbacks. You can have fun zipping around the corners, but when it comes to really putting the power down, you’re always left wanting more. Highway driving is decent, but you need to plan ahead when overtaking. One thing to look forward to with this car, though, is the aftermarket getting involved. We’ve already seen some great concepts from Mazda and others with some real racing potential. The lack of power in this 1.5 liter engine is just begging for an aftermarket turbo kit. It’s already a great handling, light car, all you need now is a few more ponies under the hood. 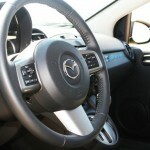 Standing back and looking at this car, it is unmistakably a Mazda. The “smiley-face” front end runs throughout Mazda’s lineup, and swooping lines down the side plays to Mazda’s key design language. 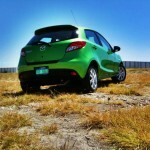 The only real problem with the looks of the Mazda 2 is the looks of the Ford Fiesta. I think the Fiesta looks much better, but that might just be me. Inside the car looks good, but isn’t as refined as what you get in the Fiesta. Mazda keeps it simple and straight forward. Our tester was nicely packaged for the price with steering wheel mounted controls and some nice red bordering along the seats. Another difference between the two cars is fuel economy. 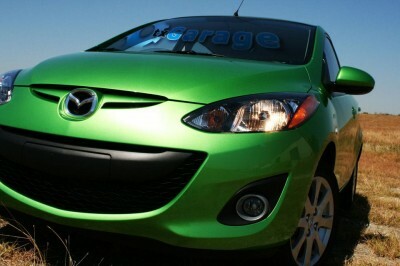 Although the Mazda is lighter and has a smaller engine the Ford actually beats it out in fuel economy. I think this mainly comes down to the transmission as you get a better geared 6-speed automatic in the Ford. Either way you’re looking at the high 30 mpg range in either of these cars. The last difference between the two is in price. Picking up a Fiesta hatch will set you back a minimum of $15,965 and the last one we tested with leather seats pushed up to just over $24k. 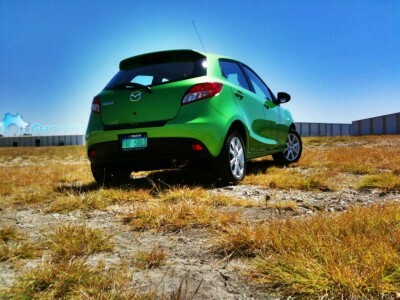 The Mazda 2 starts at $14,370 and our tester as specked out at $17,460. I can definitely see why these compact cars are catching on. If you live within a bigger city like Dallas or Houston where you’ll be negotiating tight corners and heavy traffic, these cars come in handy. 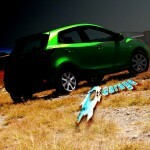 With all the options in the American market you have to choose from now, though, is the Mazda 2 the one I’d buy? Maybe. I do like the way it drives and the way it feels on the road. My only slight reservation comes when comparing it to the Fiesta. I think I’d pay the extra money for the nicer interior and better looks. More photos on our social sites! Check us out on Google+ and Facebook.